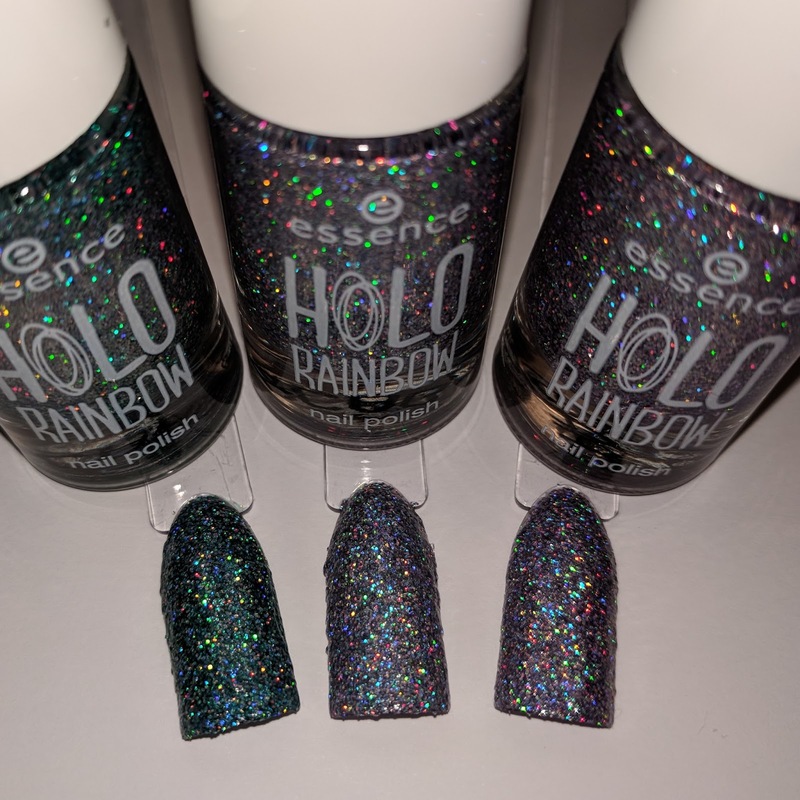 I am absolutely loving Essence's Holo Rainbow nail polishes at the moment. I first tried one back in November: Holo-Maniac, and instantly fell in love with it. This is the first shade I brought... obviously, if a collection has a teal/turquoise shade that will always be the one I buy first!! Is a silver holo polish, in a clear (slightly grey looking tinted) jelly base. Hello Holo is quite similar to Holo Fever (the next shade on the list), but this is straight-up silver, no tint of any other shade in the base. 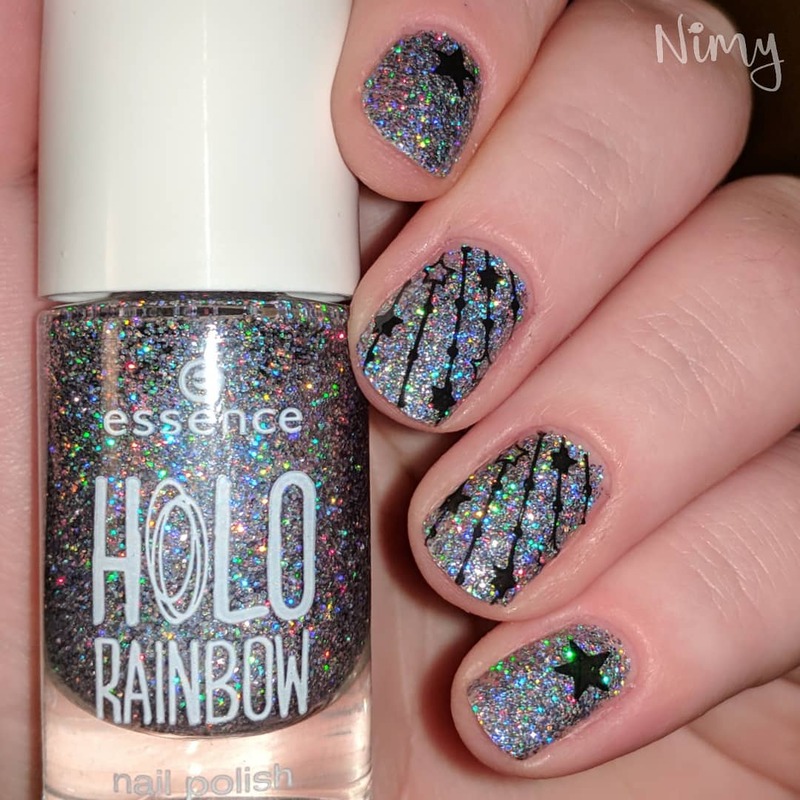 If you love holo polishes then this is a must have. This polish has a slight purple tint to it, rather than being completely silver holo like Hello Holo, although it is very similar. The difference between the 2 is much easier to see in person than it is in photos. The polish has a very translucent purple/pink base. 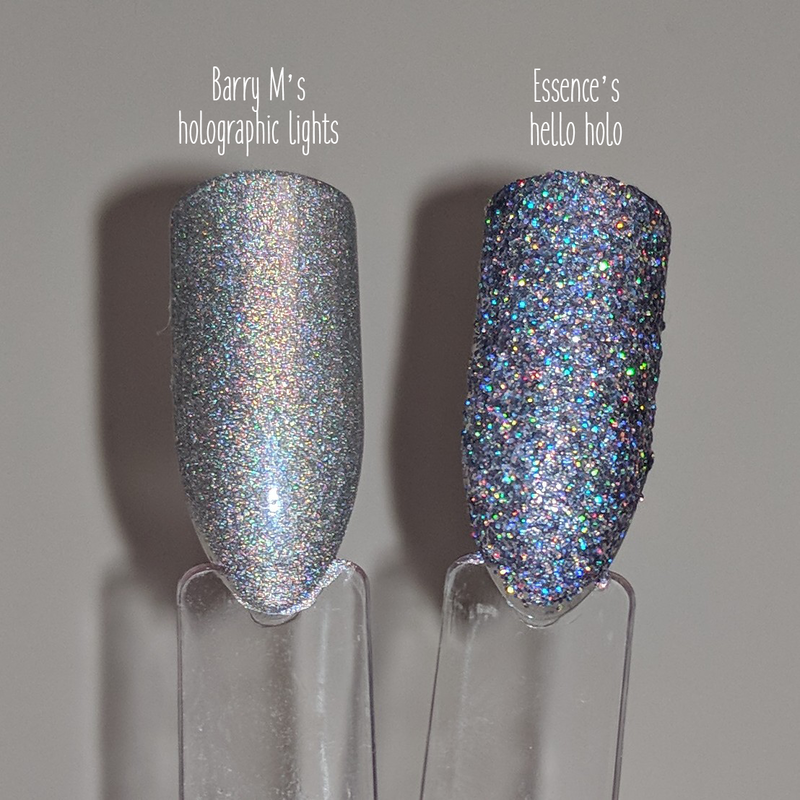 All of the polishes cover the nail in 2 coats, the polishes are chunky glitters (rather than a linear holo polish like Barry M's Holographic Lights). Because they are glitter polish they are very top coat thirsty, and I recommend at least 2 coats of top coat, because after the 1st layer of top coat the polish will still feel very textured. Obviously because these are glitter polish they are not the easiest to remove with polish remover... I recommend using a peel off base coat with these. All of these polishes are so pretty, and so sparkly... I literally can not stop looking at my nail when I'm wearing them. I don't own Holo Rocks or Holo Love, yet, but I am 100% going to get them at some point. They both look just as gorgeous and I need them in my collection! !